Debbie has another great self-paced class up for grabs. This month, this scrapbooking scroll called "Queen" in black is what caught my eye. 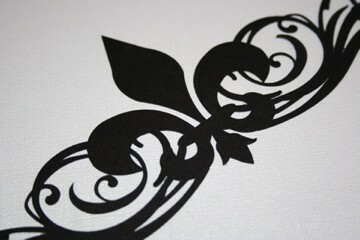 It would be a great element to add a little elegance to any layout! 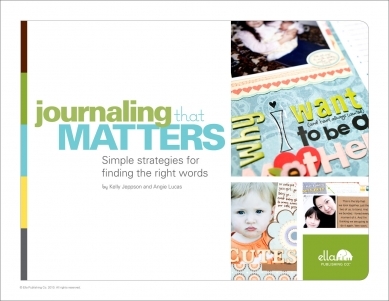 Journaling that Matters is the newest eBook to join the Ella ranks...a topic near and dear to my heart! Journaling is hard. Even for professional writers, deciding what to say on a layout can be truly challenging, let alone figuring out how to make it authentic, creative, and meaningful. But struggle no more, because help is on the way! 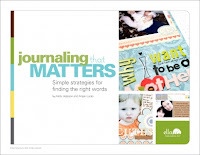 Journaling that Matters is packed with 51 easy tips to help you write from the heart without breaking a sweat. You'll love the expert advice, inspirational layouts, practical tips, and timeless suggestions that are suitable for writers of all levels—from the most experienced journalers to the most insecure. Kelly, Angie, and their eight talented contributors will help you unlock important stories and tell them with confidence. Also featuring the work of: Linda Barber, Moon Ko, Donna Jannuzzi, Layle Koncar, Audrey Neal, Keshet Shenkar, Wendy Smedley, and Stephanie Wheeler.